The organic-chemical plant, commissioned in 1979, is located at Muzaffarpur in North Bihar which is just 70 kms from Patna and is well connected with road and train. 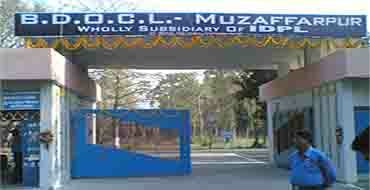 In March, 1994, this plant was converted into Subsidiary Unit of IDPL and incorporated (Company Registration No. 03-05753 of 1993-94 with Registrar of Companies, Bihar and having its Registered Office at Muzaffarpur). The plant & its township with 44 flats has an area of 65 acres (0.26 million sq. mts.). This is the only plant in the country manufacturing Niacinamide starting from alcohol as principal raw material. It has a locational advantage as 3-4 alcohol producing distilleries and more than 15 sugar mills which feed molasses to these distilleries, are situated within a radius of 150 kms. It has a large production capacity to manufacture Acetaldehyde (7500 metric tonnes), Acetic Acid (4500 metric tonnes), Methyl Ethyl Pyridine (1200 metric tonnes), Niacin (500 metric tonnes and Niacinamide (300 metric tonnes). The production process is highly automatic and continuous for Acetaldehyde and Acetic Acid coupled with equipments to avoid any pollution. It also has facilities for treating effluents generated in batch processes of Niacin and Niacinamide. The plant is being upgraded to manufacture 3 antibiotics macrolides namely Roxithromycin,Azithromycin and Clarithromycin.The production of these bulk drugs is likely to be started shortly in 2010.